Image credit: Mahindra and Taylor Parks. Art by Alex Hevesy. Mahindra just launched its new Roxor, a side-by-side that looks incredibly similar to an old Jeep. But it’s not just the looks; the hardware is very Jeep-ish, too. Let’s take a look. After looking at photos of the new Roxor and talking with an engineer, it’s become clear that the most authentic “Jeep” in America will soon be something other than an actual Jeep. That’s because the new Mahindra Roxor shares a number of designs with the original 1940s civilian Jeep, the CJ-2A (and also other CJs, especially the CJ-3B), and even wears some interchangeable parts. The suspension setup is almost exactly the same as that of an old CJ. Two sets of leaf springs are held underneath two axles via u-bolts. Those springs mount directly to a steel ladder frame on one end, and to a shackle on the other. (It’s worth mentioning that the Mahindra’s frame is fully boxed, while CJ frames tended to be “Cs” up front). Looking at the CJ-2A front suspension above, the similar leaf-spring setup is apparent. Not to mention, the hub located on the very outside of the axle looks similar, as does its rounded dust cap. The fact that a new vehicle shares any parts with a 70 year-old one is mind-boggling. Speaking of shared parts, the axles are apparently remarkably similar to those found in old flatfender Jeeps (especially the CJ-3B’s rear Dana 44), though not quite the same. And like those found on a CJ-3B (which Mahindra built its own version of under license for many years—see image above) as well as many other flatfenders, the front axle is a full-floating design, while the rear is a semi-floating setup. Here’s a look at what that means, but in short, a full-floating design means the axle shaft does not have to support the weight of the vehicle, while in a semi-float, it does share some of that load. He continued, telling me that quite a few parts from the Roxor’s axles—which are built in-house, but based originally on Dana designs—are compatible with old Willys Jeep axles, specifically the Dana 44 found in the rear of the CJ-3B and others. “The guts...You can buy off the shelf 44 ring gear and differentials, and drop them in,” he said. “I built one up the other day with a set of 5.38s.” (The Roxor, it’s worth noting, comes with 3.73 gears, though Davis told me shorter gears may be an option later). But the Roxor’s differential has a unique “offset,” so a few modifications would need to be made for those interested in using straight-up Jeep parts. So there are clearly quite a few similarities between an old flatfender Jeep’s suspension and axles, but—especially up front—there are also a number of notable differences. For example, the Mahindra’s shock is mounted behind the front axle, and the front brakes are discs and not drums. Not to mention, the leaf spring shackles on the Willys are C-shaped, whereas the Mahindra uses a square-shaped setup (see above). The CJ-7, like the Roxor, has disc brakes up front, its shocks are mounted behind the axle, the shackles are rectangular, and there’s actually a sway-bar, unlike in a Willys Jeep. Plus, unlike old flatfenders (which used bellcranks), the Mahindra has more of a CJ-7-esque steering setup, with a pitman arm pushing and pulling a drag link, which rotates the knuckle on the passenger’s side (this is what turns the wheel). That knuckle—or, in the case of the Mahindra, the drag link—then pushes and pulls the knuckle on the driver’s side via a tie rod (thus turning the other wheel). So yes, from a steering and suspension standpoint, the Roxor is very CJ-ish. The axles are based off of Dana 44s like those found in the rear of 1950s-era CJ-3Bs, and can even house some common parts, and the suspension and steering design looks almost exactly like what’s found on a later CJ like the CJ-7. The transfer case is especially fascinating, because it’s a Mahindra derivation of the old Dana/Spicer Model 18, which was found in all flatfender Jeeps beginning in about 1940. Davis continued, saying: “It’s kind of modeled or an evolution of the old Dana Spicer.” It even has the same 2.46:1 low range ratio as many flatfender Jeeps, including the CJ-3B. How much is interchangeable, Davis doesn’t know, but he did say that he put a Dana/Spicer Model 18 Power Takeoff cover on it. 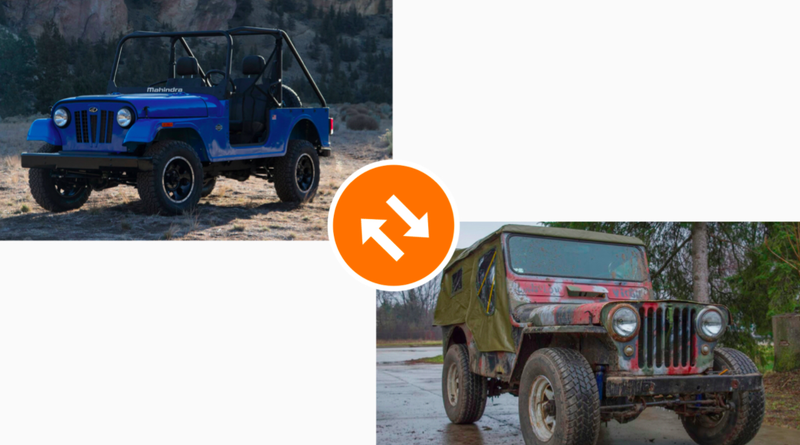 Though parts of it are clearly derived from a flatfender, the body—like the steering setup—definitely looks more similar to a CJ-7 than to a flatfender like a CJ-3B. The rounded front fenders and the filleted door opening that makes a sharp right angle to the top of the rear tub was clearly inspired by a CJ-7 like the one shown below. Dimensionally, the Roxor is closer to the CJ-7 than it is to CJ-3B, with its 96-inch wheelbase stretching a full 16-inches longer than the latter’s, but only 2.5-inches longer than the former’s. Overall length, too, is closer to that of a CJ-7, with the Roxor’s 148-inch stretch pretty much matching that of a CJ-7. That said, the width of 62-inches go to show that the Roxor definitely seems like it was derived from the CJ-3B, which has essentially exactly the same breadth. Under the hood of the new Mahindra Roxor is a 2.5-liter direct-injected inline-four “M2DICR” diesel engine making 62 HP at 3,200 RPM and 144 lb-ft of torque at 1,400 RPM. This is in no way a Jeep engine. That said, those power and torque are extremely similar to what the rare Perkins 3.1-liter four-cylinder diesel engine offered in the Jeep CJ-5 in the early 1960s. That motor cranked out exactly the same amount of horsepower—62—but it made it slightly lower in the rev range—3,000 RPM versus 3,200 RPM. The torque figures are also quite similar, with the CJ-5 making only a single lb-ft less—at 143 versus 144—and that peak torque came in at 1,350 RPM versus 1,400. As for the transmissions, like later Jeep CJ-7s, the Mahindra gets a five-speed manual. No, its not the BorgWarner T-5 found in the CJ, rather, it’s a gearbox designed in India, according to a Mahindra representative. Still, it’s a five-speed, it’s 3.778:1 first gear ratio isn’t far from the CJ-7's 4.03:1, and it probably has nice, long throws just like the Jeep. The Mahindra Roxor is definitely as mechanically Jeep-y as it gets, sharing quite a bit with the CJ-3B of the 1950s and 1960s. It’s got a similar transfer case, similar axles, a similar suspension and essentially the same width. As for the styling, steering setup, and overall length, those don’t quite look what’s on a CJ-3B, but they look almost identical to those of another CJ, the CJ-7. And though the transmission and engine are not related to Willys Jeeps, their specs aren’t far from what was offered in some CJ models throughout the years. So yes, when it launches, the Mahindra Roxor will be the most authentic “Jeep” you can buy (even though it’s not road legal)—even more so than the Wrangler. And that’s pretty wild if you think about it.